Making robotics accessible has been a career-long goal of mine. For many of the themes of this blog: all citizens should be empowered to use robotics (and computing) technology in their own work, and the fields of robotics and computing need to be informed by a diverse set of contributors. My class on Drones this Fall will continue this track of teaching and research. Starting with some of my earliest work on using open-source software with robotics and then later with my work with IPRE on using robots in CS-1, I have been on a mission to make robotics more open, transparent and adaptable. My latest effort in this vein is embodied by the Calico Project. Calico is a learning environment for computing particularly suited for robotics. Calico is about choice: choice of operating system, choice of programming language, and choice of programming context. The particular operating system (e.g., Windows, Mac OS X, and Linux) or programming language (e.g., Java, C#, Scheme, Python, Ruby) should not limit your pedagogical mission. Although Calico started as a way to easily program the IPRE Scribbler robot in Python on all three platforms it has evolved into a system that allows students to explore a variety of computing contexts (e.g. Processing-inspired graphics) with a variety of languages (e.g. scheme). We have extended Calico to work with other robot platforms like the Lego NXT and the Finch. Our next step, in the spirit of Pyro, is to use Calico as a front-end to the Robot Operating System (ROS). 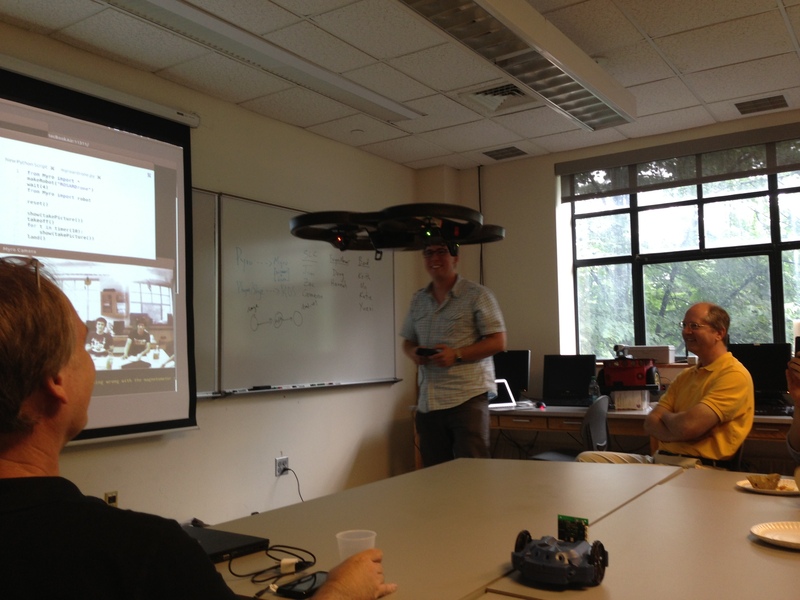 Last week, we had a Calico summer research meet-up at Sarah Lawrence College. Part of this meeting was devoted to understanding how we could use ROS with Calico. A prototype system was presented that is able to control both the simple ROS turtle simulation, but also the Stage robot simulation, the iRobot Create, and the Parrot AR Drone. We are in the process of flushing out this interface and writing a proposal, stay tuned! on computing, robotics, education, this, that, and the other. Ryan on Robots Make CS1 Real.